I have problem building ceiling light like a on picture below. In left room corner is actor mesh inserted to level after full build - is ok, it should look like this after light bounce etc. On the right is this same mesh after full light build - is 99% dark. Both meshes (this is same mesh) are created from wold simple mesh and converted to static mesh, they have same material. In the middle, is simple world mesh (smaller one) not converted to static mesh - just common ceiling mesh. This simple mesh looks good no matter before or after full light build. All meshes have same material and same lightmap settings - I check this few times. Light is stationary only. ps. Ambient light, additional lights, skylight etc are no go in this case. what is lighting the room? Yes, this is important :) Light is spot light direction down, just under lamp covers. Light in room is bounced from floor. It works good with world meshes not transformed. are you dynamically creating the meshes on level run? it seems to me that you're not using preplaced static meshes. Hello, I was out of computer few days. I think problem was with bad/overlapping uv on some mesh. I have on this test scene meshes from Epic samples, but many are outdated I think. 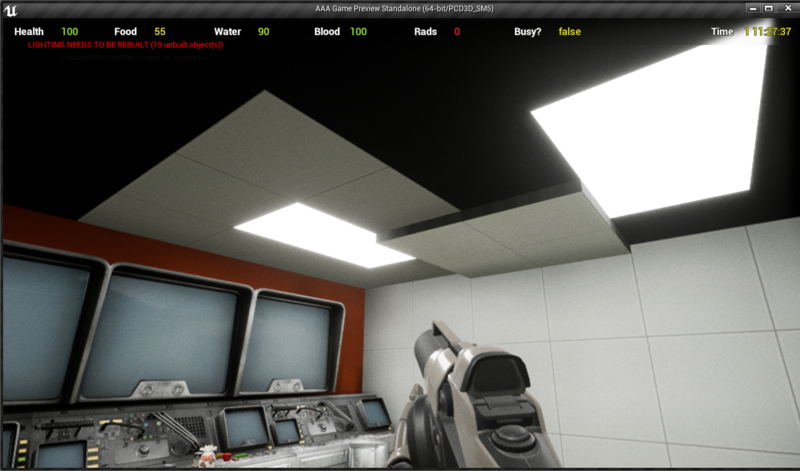 After full light build it make strange artifacts, I have no black ceiling more like this. Thanks and have a nice day!